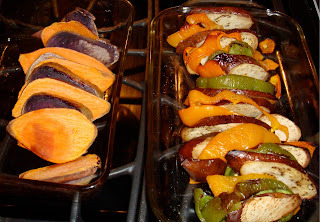 Yuan sent me this photo of roasted vegetables that she made last night with purple yam (see the January 18 blog entry for more information on purple yam), sweet potato, eggplant, and a variety of colorful peppers. If you haven't yet had the pleasure of roasting vegetables (Eastern or Western), they are unbelievably easy and delicious. Roasting brings out a slightly sweet flavor. 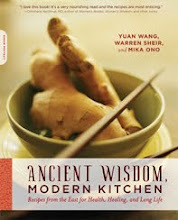 Types of vegetables to roast can include potatoes, onions, beets, leeks, mushrooms (I like shiitake), and carrots, as well as the vegetables that Yuan features here. To roast my vegetables, I like to cut them into 1-inch cubes, spray a roasting pan or cookie sheet with oil, lay the vegetables into a single layer on the pan, then again spray the the vegetables lightly with olive oil and sprinkle them with salt. Alternately, I toss the vegetables with a couple tablespoons of olive oil and a little salt until they are coated evenly before putting them on the pan. I preheat the oven to 375 degrees, then bake the pieces, stirring once or twice to turn them. I aim for a total cooking time of about 45 minutes (but it ends up being more or less depending on the type of vegetable, the size of the pieces, and how crispy I want them). Yummy! The roasted veggies look amazing...now off to find some brussel sprouts close to midnight!